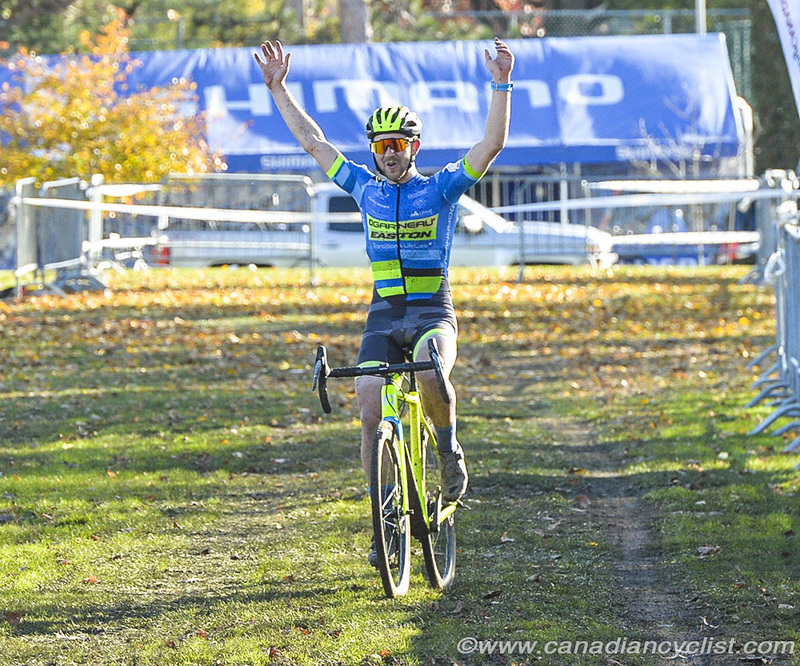 Two first-time Elite champions were crowned on Saturday at the final Canadian championships of 2017 in Sherbrooke, Quebec, when maple leaf jerseys were awarded at the Cyclo-cross Championships to Junior, Under-23, Elite and Masters athletes from across Canada. Under brilliant blue skies and sun, nearly 400 riders competed for national titles. After a cold start to the day, the 3.5 kilometre course gradually warmed, with afternoon races taking place under perfect conditions. Tyler Clark (KMS Cycling-Killington Mountain) of Ontario dominated the Junior Men's race, leading from start to finish, to cross the finish line 31 seconds ahead of Colton Woods (Trek Store CC) of Ontario, with local Sherbrooke rider William Cote (Dalbix Sherbrooke) winning the bronze. Ruby West (Cannondale Cyclocrossworld.Com Devo Team) of Ontario won the Under-23 women's race in similar solo fashion, 38 seconds in front of Magdeleine Vallieres Mill (Club Cycliste De Sherbrooke). In the men's Under-23 race, it was a race-long battle between Quebec's Raphael Auclair (Pivot Cycles - OTE) and Brody Sanderson (Centurion Nextwave) of Ontario. It wasn't until the final lap that Auclair was able to gap his rival on one of the straightaways to win by a slim eight seconds. 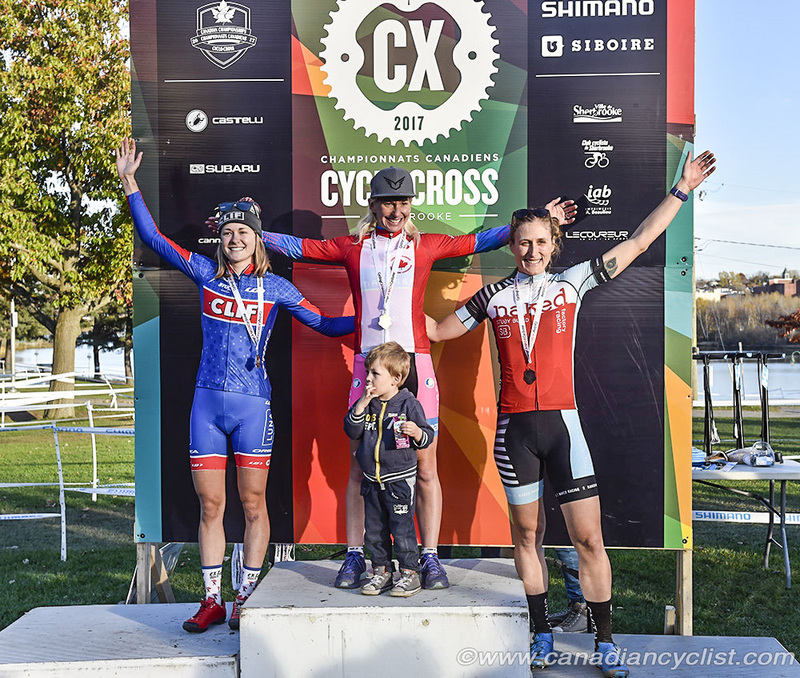 The Elite women's race at the Canadian Cyclo-cross championships in Sherbrooke, Quebec, saw an upset on Saturday, when Christel Ferrier Bruneau (SAS Macogep Aquisio) beat defending champion Maghalie Rochette (Clif Pro Team). 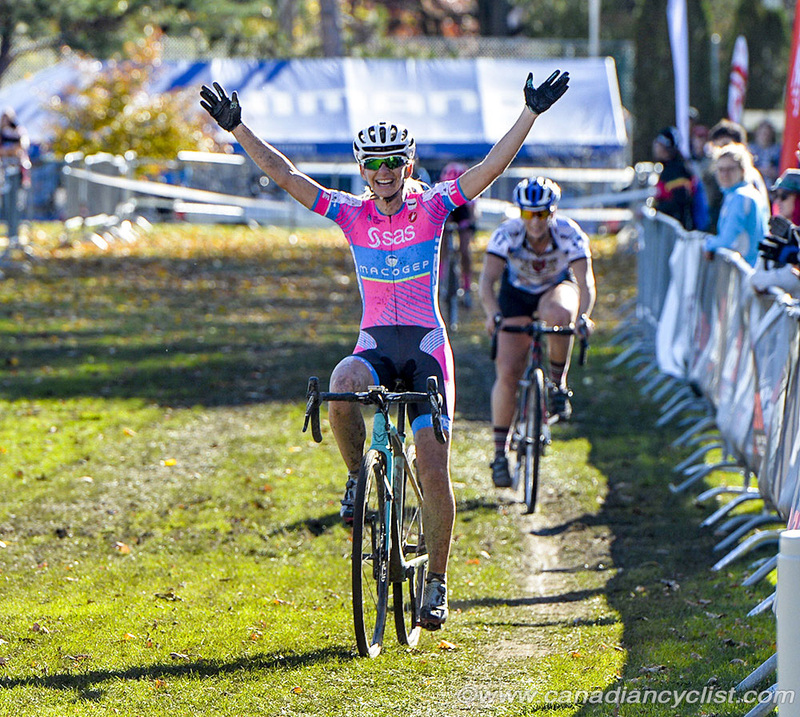 Ferrier Bruneau is originally from France, where she has finished second three times at the French cyclo-cross championships, as well as winning a road title. However, she moved to Canada and took out Canadian citizenship. 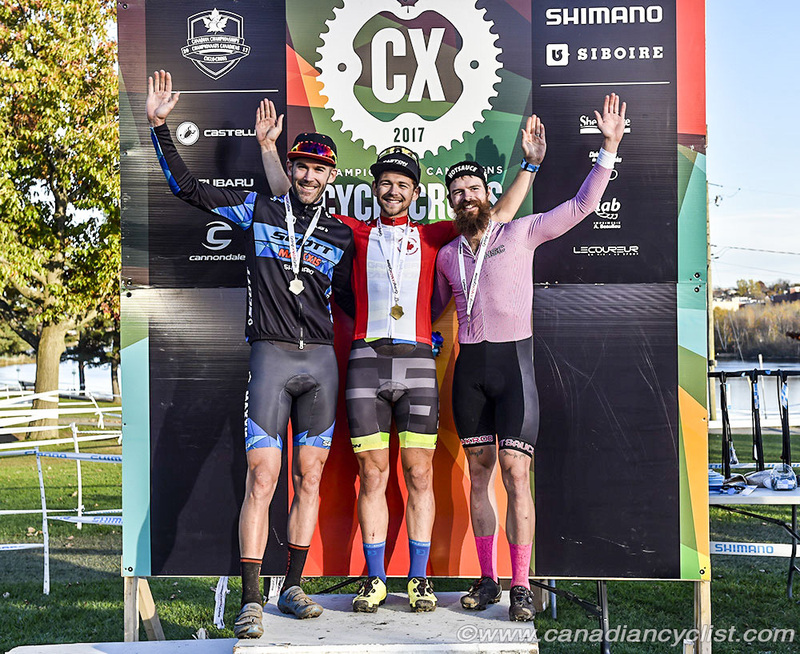 This was expected to be a battle between Ferrier Bruneau and Rochette, and the duo dropped the rest of the field on the first lap. Rochette led for much of the race, opening a gap on her rival mid-race. However, Ferrier Bruneau fought back and, with a lap and a half to go, attacked counter-attacked. Rochette was unable to respond, and Ferrier Bruneau rode away to win by 38 seconds. Mical Dyck (Naked Factory Racing) of B.C. took the bronze medal. "Maghalie is a really good rider," said Ferrier Bruneau, "but I have had some better results than her in the North American World Cups, so I knew I could do well. Maghalie was better on the technical sections and I lost a bit of time in a corner, but I stayed focussed and came back on the climb, and was able to get away. It's my first victory of the year in cyclo-cross, which is really nice." Michael van den Ham (Garneau - Easton p/b Transitions Lifecare) finally won his first Elite title in the men's race. The race was wide open, after the retirement of 2016 champion Jeremy Martin. Alberta's Mark McConnell (Hot Sauce Cycling) went to the front on the opening lap, joined by multi-time national champion Geoff Kabush (Scott Sports - Maxxis) and Rio Olympian Raphael Gagne (Cannondale 3Rox Racing). However, van den Ham moved up quickly to join the leaders. Gagne faded and Kabush couldn't manage the pace of the other two. When van den Ham attacked at the midpoint in the race, riding a steep run-up that no one else could, it proved to be the decisive move, and the B.C. rider rode away to take his first Elite title. Kabush put on a late surge to take second ahead of McConnell. "It feels amazing," said van den Ham. "I've gone into the last three Nationals ranked Number One, so, to be honest, this feels like a weight off my back. It feels good to finally get the maple leaf jersey; I've been dreaming about it for a long time. I didn't have a great start, so I decided to sit tight for a lap or two and follow the front group. I could see Mark [McConnell] was starting to make mistakes, and I knew I could ride the run up, that was my secret weapon. I got five seconds and then just rode it steady."